Another extremely rare Warren Vampirella item, the jigsaw is a prized item for the Vampirella collector. No doubt there are many of these lurking in attics and broom cupboards, but how many still have all the pieces, and the original box? This huge jigsaw measures 15 ins./38 cms. x 21 ins./53 cms. when complete. The box it comes in measures 9.25 ins./23.5 cms. x 12.5 ins./31.5 cms. On the rare occasion that a mint jigsaw, still sealed in it's original cellophane, comes up for sale it fetches top prices. More often you see them built and framed. 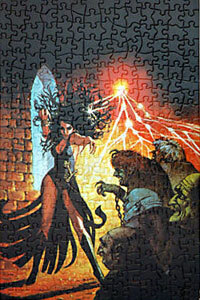 In 1977, Warren released two jigsaw puzzles of the covers to Creepy #1 and Vampirella #2. They measured 11 x 17" when assembled. These were made for display, marketing and for a permanent record of the manufacturer's work, much like a file copy was kept by the publishers of comic books. Only a handful were made. 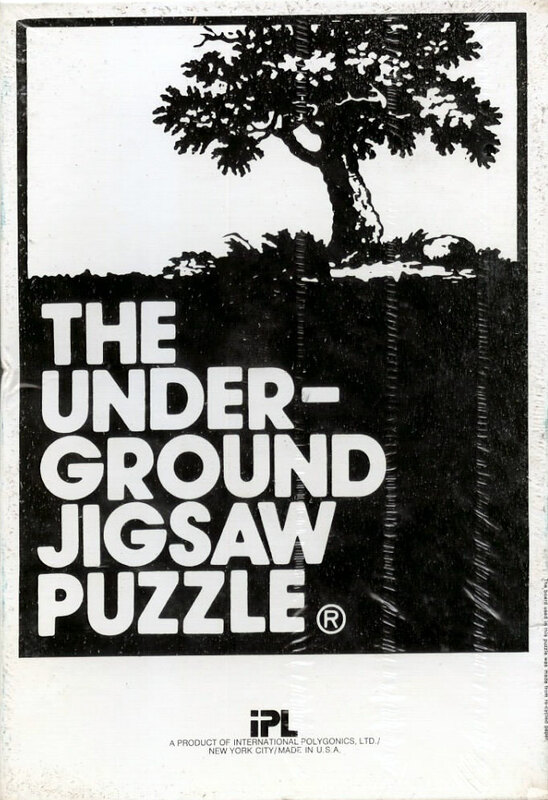 This jigsaw is called a "half-cut" because the cutter only passed halfway through the cardboard. This means you have the full impression of the puzzle as if it were completed, but it is solid and does not come apart. 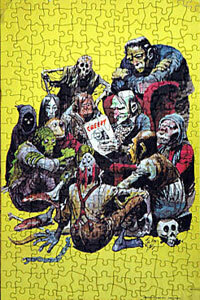 Click here to see a scan of the Creepy #1 jigsaw.